As both digital channel account acquisitions and application fraud increase, assessing applicants’ digital identity is critical. Boston, March 29, 2016 – New-account acquisition is an increasingly challenging proposition for financial institutions. Transitioning consumer preferences and regulation pushing for financial inclusion are daunting enough, but the U.S. migration to EMV and reams of personal data compromised in data breaches mean criminals have the incentive and the means to perpetrate application fraud. Are digital identity risk assessment and mobile data capture the technologies that can slow the burn? This Impact Report examines how U.S. FIs assess new-account risk for demand deposit accounts and credit cards, and how these practices will evolve over the next couple years. 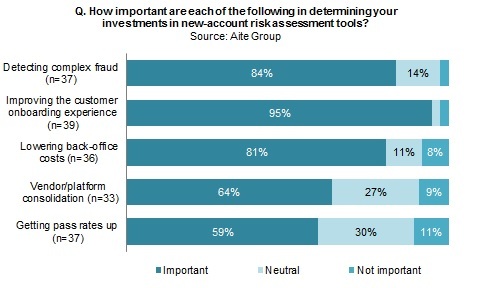 In November and December 2015, Aite Group surveyed executives from 83 U.S. FIs to understand the trends in new-account risk assessment and also interviewed leading vendors in the space. This report mentions Early Warning, Equifax, Experian, FIS, and TransUnion. This 35-page Impact Report contains 22 figures and six tables. Clients of Aite Group’s Retail Banking & Payments service can download this report.